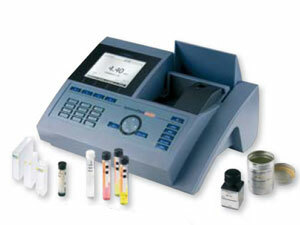 The spectrophotometer of the spectroFlex series for the VIS and UV/VIS range offer the unique combination of systematic and spectral analytics with the established analytical quality assurance AQA and the convenience provided by the filiter photometer. Selection tables for most convenient selection and search of data, parameters, methods etc. Direct methods such as SAC, colour etc. The instrument supported Analytical Quality Assurance has become a must for all industry branches, in order to guaranteeplausible and correct measuring results. The spectroFlex series supports the AQA for checking the instrument and individual routine measurements. The administration of user groups for larger laboratory environments including administrative, user and guest profiles is also supported. The AQA can be switched on or off. The settings can be stored in 20 profiles each and recalled when required. The storage capacity of 4 MB can store aprox. 100 spectra of 300 “ 900 nm and 400 kinetics sets with each of 150 measuring values. The data can be transferred to a PC and printer or via USB hub into a larger environment. Also sample identification numbers can be read by connecting an external barcode reader. An optional software for easy data processing is available for the PC. A spectrophotometer™s regular operation place is the laboratory, although it can be quite practical at some times, when an instrument can also be operated on-site at a measuring station. The light-weight and easy to handle spectroFlex models enable this mobile operation. Most important is a careful transportation, a protected measuring venue and an especially good measuring preparation regarding heating period and zeroing after transportation! Besides the transportation case, the accessories include a 12 V adapter cable for a common car storage battery.